--Logan Pearsall Smith. This line brought to mind an earlier sentiment from Marcel Proust. A few months ago, we brought you news about the plague of unnecessary quotation marks, which prompted a lively conversation. Now, we feel duty bound to note its kissing cousin, the missplaced apostrophe. The always-attentive Columbia Journalism Review has the whole sad story. We heartily welcome your thoughts on the matter. 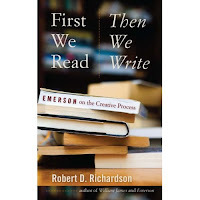 Our winner this month: First We Read, Then We Write: Emerson on the Creative Process. The nod for runner-up goes to Both Ways is the Only Way I Want It, a collection of stories. You can review earlier favorite book titles here, and as always, we invite you to share your favorites. 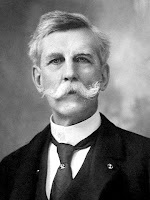 --Supreme Court Justice Oliver Wendell Holmes. He made a previous appearance here two years ago. 'In Argentina over the weekend, Buenos Aires held its annual Noches de las Liberias--Bookstore Night. The city closes a main avenue, and places sofas and chairs where cars and trucks normally idle. People with books from the many bookstores lining the avenue lounge in the seating, and a festival atmosphere replaces traffic.' NPR has the full story, which you can either read or listen to. Ever wonder how December 25th came to the date on which we celebrate Christmas? I know I have. Luckily, Biblical Archaelogy Review has what seems to me to be perhaps the most authoritative answer I've yet come across. --from a brief piece on the impressively prolific writer Gary Wills, in the current Vanity Fair. We thought this better captures the man, in but a single paragraph, than most writers could accomplish in thousands of words. You can review earlier best leads here. In this Great Recession, which has hit writers at least as hard as other industries, I've had the opportunity to coach more than a few writers who find themselves in transition, as they consider the next phase of their career. I've pointed some to a segment of the industry that's easily overlooked--technical writing. That involves writing such things as user manuals, training videos, software guides and all kinds of other useful materials we take for granted, all of which are written by professionals. It helps that there's a vibrant community of these folks in my region--the Northeast Ohio Society of Technical Communication. I simply point folks in that direction, and that lively, welcoming group sometimes does the rest. But there's another easily overlooked writing subculture: grantwriting. There again, Northeast Ohio happens to have a vibrant community. You can go here, to the Foundation Library, which is associated with the Cleveland Foundation, to learn more about various grantwriting classes. I hope some readers will look into that, and report back on what they find. --George Orwell. You can review our many earlier mentions of the oracular one here. Okay, so my football team, the Cleveland Browns, finally won its second game last week. Forgive me if I'm not doing cartwheels in the street. The team's record, after all, is still 2-11. Epic futility such as that tends to draw attention (as it did earlier here). The Onion had a little fun recently at the Browns' expense. As long as you're checking out that Onion spoof dispatch, you might as well also review this one as well. And maybe this one too. And just to be safe, this one also. Finally, just for the hell of it, take a moment to watch this video. Then, let us know what you think. --Groucho Marx. If it helps any, just think of this as a wry companion to the previous post. --What a nice countercultural touch: couples who have stayed together for a half century. This story charmed me. I hope you'll enjoy it also, and perhaps share your reactions. 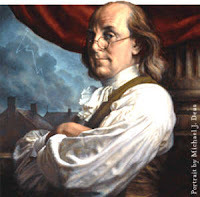 --Ben Franklin. You'll find earlier mentions of the electrifying founding father here. Marc Morganstern is a legendary deal-making attorney and investor. He was once a Clevelander, but now spends much of his time out west. Not long ago, I happened to come upon his company website, which has a page of his maxims. I especially admired the elegant concision of one of them: "If you can't write it, then you don't really understand it." You'd be surprised how many otherwise bright people never seem to grasp that simple idea. I acted, and behold duty was joy. --Rabindranath Tagore, winner of the 1913 Nobel Prize for Literature. You can view a brief video about his life and accomplishments here. --Simone Weil. The late French activist & Christian mystic is too little-known, we think. I was also struck by this passage from perhaps her best-known essay, Human Personality: "At the bottom of the heart of every human being, from earliest infancy until the tomb, there is something that goes on indomitably expecting, in the teeth of all experience of crimes committed, suffered, and witnessed, that good and not evil will be done to him. It is this above all that is sacred in every human being." Now there's a perfect thought to frame the weekend. Here's our favorite provocative headline of the week (do you think this could prompt a fistfight at a meeting of Zionists? I do). Here's our favorite haunting image, from a blog published by a treasured WWW reader and frequent commenter, the divine Ms. Kass. And here's our favorite new blog of the month, published by our old friend and mentor, Bill Gunlocke, who also publishes a limited-circulation print companion in Manhattan. Good luck with it, Billy G. You can review earlier mentions of Bill here. --George Santayana. As we noted earlier here, the philosopher is perhaps best known for his maxim "those who cannot learn from history are doomed to repeat it," which has itself been repeated ad nauseum. As this bio notes, "he thought of philosophy as literature," and of course in the hands of such a supple and original thinker as he, it indeed is. Gary Trudeau's Doonesbury cartoon roasts a cohort group that seems to deserve a little ribbing. But if you're into this kind of thing, here's a journalist's guide to Twitter. 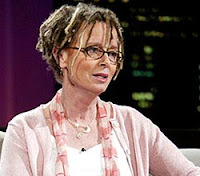 --the writer Anne Lamott, quoted in a documentary about her life. You can review our many prior mentions of the gifted one here. Every morning begins with a leisurely stroll through the paper version of the New York Times. Yesterday, I paid special attention to this article, and this morning to this one. Though the subject of each is nominally football, the real themes are family, loyalty, dedication and sublimely inspirational people. Reading each one changed how I went about my day. I hope they might have a similar effect on you. If so, we'd naturally love to hear about it. --from a recent personal ad in the New York Review of Books. 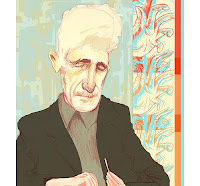 Our most recent mention of the uniquely wonderful NYRB, back in October, sparked a lively and interesting conversational string. As for that term cougars, if you're not familiar with it--as I wasn't until not too long ago (but now I seem to see mentions of it everywhere), here's a good working definition. UPDATE: We decided to try to answer our own question about the roots of this coinage. Turns out it's an idea virus from, of all places, Canada. From Wikipedia: "Cougar: a woman over 40 who sexually pursues younger men, typically more than eight years her junior. The term is Canadian, appearing first in print on the Canadian dating website Cougardate.com and has been used in TV series, advertising and film. The 2007 film Cougar Club was dedicated to the subject and in spring 2009 TV Land aired a reality show called The Cougar." 'I tell my clients, 'you can do anything you want, you just can't do everything you want.'" --overheard from a speaker at a recent Cleveland Coach Federation gathering. Isn't that the problem with so many smart people--that they try to do too much, thus spreading themselves too thin? Okay, enough about what we think. What think you? 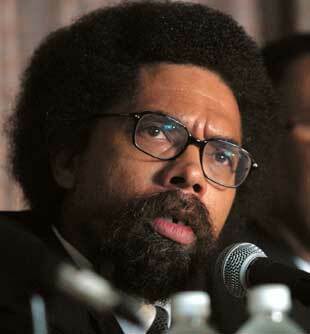 --Cornel West, from his new memoir, Brother West: Living & Loving Out Loud.